The Irish tricolour is the national flag of Ireland. It is a vertical tricolour of green white and orange. The flag symbolises the inclusion of the people of different traditions on the island of Ireland. Though first unveiled in 1848 the Irish tricolour was only formally adopted as the national flag of Ireland in 1937. 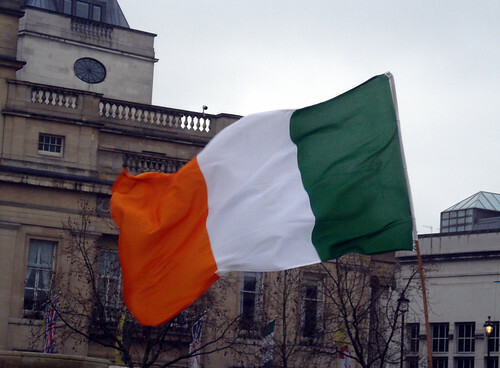 The flag of Ireland was first unveiled at a meeting in Waterford City on March 7th 1848. 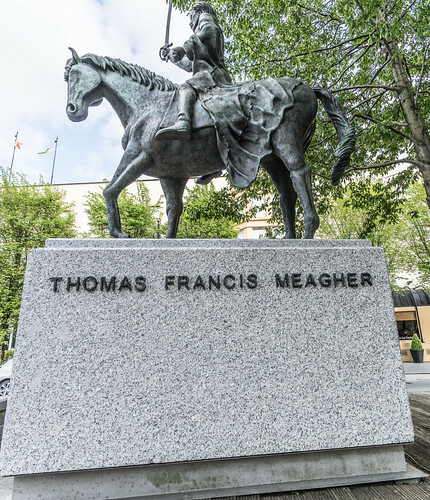 It was brought to Ireland from France by the Young Irelander Thomas Francis Meagher. Meagher had gone to France with other members of the Young Ireland movement to study revolutionary activities. During his time there he was presented with the tricolour by a group of French women who were sympathetic to the Irish cause. Following the unveiling in Waterford Meagher formally presented the flag to the citizens of Ireland at a meeting in Dublin in April 1848. At the presentation he stated: ‘The white in the centre signifies a lasting truce between the orange and the green’. The tricolour was raised over the General Post Office in Dublin during the Easter Rising of 1916. It was adopted as the flag of Ireland by the Government following independence in 1922 and was given constitutional status in 1937. The Irish tricolour, the national flag of Ireland, was presented to the citizens of Ireland at a meeting in Dublin in the year 1848 On This Day.